Condo Culture | Top 5 Ways CondoCulture.ca will help you get the most out of your condo search. Top 5 Ways CondoCulture.ca will help you get the most out of your condo search. Hey Condo Culture faithfuls, we hope you’ve had a fantastic week. Part of what we love most about what we do is helping you make the best decision buying a condo and seeing the excitement on your face when you find your perfect space. We love real estate but what ignites our passion most is when we see our customers truly excited about their new space. It can be a big investment but whether you’re buying to live or buying to invest, there’s nothing more exciting than finding the perfect opportunity and knowing you’re going to absolutely love living there and are creating an opportunity to build more wealth for yourself by doing so. But we all know finding the proverbial perfect condo can be easier said than done and there’s often a whole lot more to it than simply touring the first property and submitting an offer. An offer on that perfect space is usually preceded with weeks, months or even years (we still love you) to find the perfect space. Regardless of the time it takes, part of our job is to be here for you and support you through the all the highs and low to make sure the process is as easy as possible and ensure at the end of the day, one thing happens: you’re always making the best move for YOU. So why does all this matter? Quite honestly, we are obsessed with 2 things: condos and the experience our customers have when buying a condo. We help people buy and sell condos everyday, know the market inside and out and wake up every morning thinking about how we can make the process of buying or selling a condo the best experience possible for you. The real estate industry is a funny beast. It’s has a lot of positive attributes but there are certain things that make you just sit there and go...huh? Part of that to us is the way people search for condos online. Did you know that well over 90% of buyers start their real estate search on the internet? Sure, over the last few years a few of the popular search sites have slowly started to get better and better. But here’s the problem. It’s one thing to search for a home online but when you’re buying a condo, you’re buying into the building just as much as you’re buying into a specific unit. In fact, the building is arguably just as or even more important than the unit itself. So why then do the majority of real estate sites only focus on the units, not the buildings, forcing you to search all over the internet for the information you want on the buildings? What if all of this information was all in the same spot? We helped bring an end to that painstaking searching with the first version of our new website (and our unique condo real estate stores...another topic altogether…..check them out if haven’t yet had the chance…..they’re sweet :) ) by offering a platform where you can visit and view everything in one spot, flip between building and units, learn about both and book a tour of the listings (and buildings) you liked the most. With your feedback, we’re helping to make the process of searching for a condo as easy and educational as it can be and we’re not stopping there! Without further ado, we present the top 5 ways our new online web tools will give you an edge when searching for your next condo! A lot of you have told us you love our weekly newsletter because each week you get a quick summary of everything new to hit the market in the areas most popular condo buildings. Our new Following function for Cities is everything you love about our weekly “List” showcasing the newest condos to it the market in a more flexible, user friendly format. But we’ve decided to take this a step further. By creating an account on CondoCulture.ca, you can now not only continue to get updates weekly but those of you who are serious about their search can crank up the frequency and get these on the daily to ensure you’re always on top of the latest listings. Not only that, following a city will also give you updates on all of the newest buildings to hit the market too. Fancy yourself a pre-construction investor or just love getting in early? You’re going to love this. Start following your favourite cities by clicking heart that shows up beside each city name as you search and you’ll not only get updates of newest listings to hit the market, you’ll also receive an alert whenever a new building is announced and getting ready for pre-sales. 2. Tour Listings First. As Soon as They’re Listed. Whether you’re searching CondoCulture.ca with a glass a wine in your hand after a long day or just received an update for unit that just became available, booking tours of your favourite units is quicker and easier than ever. Simply click the Book a Tour button on the listing or building page and you can book tours of your favourite units in less than 30 seconds. 3. Off-Market Listings & Condo Culture Exclusive Properties. Unfortunately when it comes to condos, not everything is published on Realtor.ca. Searching for a condo on CondoCulture.ca not only gives you thousands of resale units to choose from but you’ll also come across other units that aren’t available on Realtor.ca such as inventory in new projects and off-market listings exclusive to us that you won’t find anywhere else. We’re improving this regularly so keep an eye and you’ll continue to see more and more available properties on CondoCulture.ca that you won’t find on any other real estate site. Diamonds in the rough you might say? 4. Love Everything About a Building But There Are No Units Available? We see this often in smaller boutique buildings but it can also be true across some of our more popular larger buildings. Believe it or not this can sometimes be a good sign, especially if it means owners there love it to and don’t want to leave! Before you’d have to keep a constant eye on the market for fear that if a unit became available in your favourite building, you could miss it. Not anymore with our new follow function for buildings. Start following your favourite buildings by clicking the heart at the top right hand corner of each building page and even if there’s nothing available now, you’ll be among the first to know as soon as something pops up! 5. Sold Data & Advanced Building Analytics. It’s often said “you don’t make money when you sell real estate, you make your money when you buy”. For this reason and many others, it’s important to be as knowledgeable as possible as to what properties are selling for, not just across the market as a whole but in the specific buildings you’re most interested in. 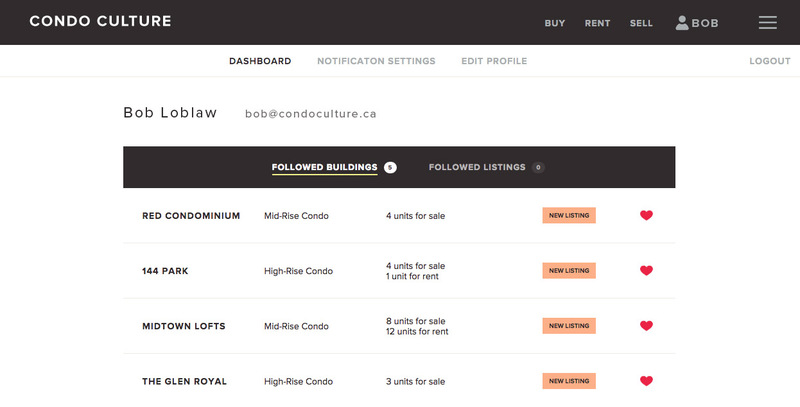 When you log into your account on CondoCulture.ca you can now view sold data trends and a host of other value tidbits on all of our new building pages. You’ll be able to view advanced analytics for all of the most popular buildings in the local market such as how fast units are selling in the building, average selling prices across various suite types, how it compares to other buildings, how many units sold vs. how many became available, how condo fees in the building compare to the market as a whole and what units tend to sell for as a percentage of their listing price. You can also check out appreciation charts across each city to determine which cities are growing and have been appreciating at the fastest rates to determine where the best investment may be had. Smarter way to condo search? You bet! Setting up an account on CondoCulture.ca is free and only takes a minute. Get the ball rolling tonight by going to our homepage and clicking Login on the top menu bar. Have a great weekend everyone and Happy Condo Hunting!